Things are getting heated in the Indian digital wallets space, and Indian startup wars are getting real. With lots of competitors, lots of VC money and India’s huge payments market at stake, companies doing what it takes to survive, and are fiercely protective of their positions within the pecking order. And when Freecharge released a report which implied that it was doing better than its competitors, rival MobiKwik wasn’t pleased. This report was carried by all major newspapers and blogs, but when Mobikwik pored through it, the company says it found several discrepancies. In a blogpost, MobiKwik claimed that Nielsen’s approach was “callous and inaccurate”, and favoured Freecharge over other companies. It said that Nielsen’s sample size of 6000 was too small to draw conclusions about a market as large as India. It also said that the company used a timeframe of May to July 2015, while Freecharge was launched in September of that year. And perhaps most damningly, it said that the report was not an impartial report, by a custom report sponsored by Freecharge. 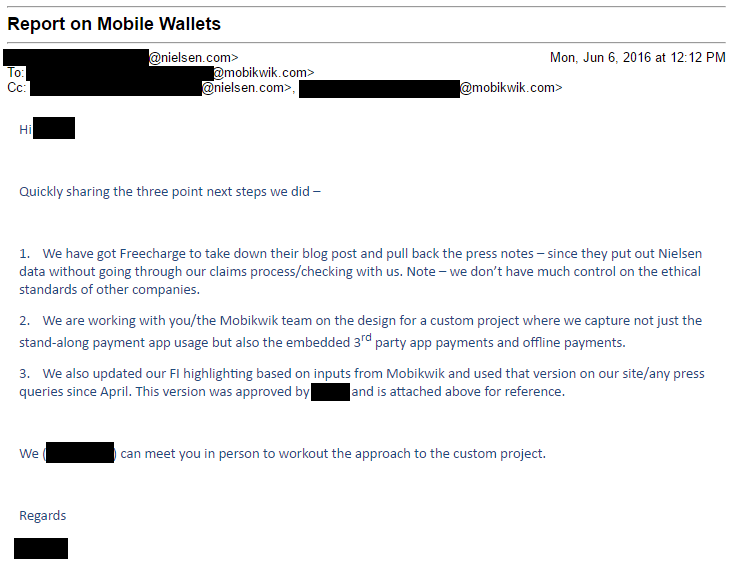 MobiKwik then contacted Nielsen, who admitted that the report had indeed been cited wrongly, and asked Freecharge to take its blogpost down. While the last part is true (for a 95% confidence interval and a population of 300 million, the sample required is around 9000, which doesn’t seem all that different from Nielsen’s), there’s still the niggling question around paid reports. With enough effort, data can be twisted to say what you want it to say, and if brands like Nielsen publish reports that’s aren’t objective and impartial, that doesn’t seem to be a good sign for India’s startup ecosystem. And as the tone of the 2 blogposts shows, there’s clearly no love lost between Freecharge and MobiKwik. Regardless of how this controversy plays out one thing is clear – while Paytm is (for now) at the top of the Indian digital wallets pile, the battle for the no. 2 spot just got a lot more intense.